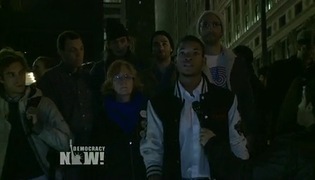 Police Crack Down on Occupy Wall Street Protesters, Journalists on Movement’s 3-Month Mark | Democracy Now! Democracy Now! reporter who has been closely following Occupy Wall Street. He has been blogging about the movement for The Guardian. AMY GOODMAN: We turn now to Occupy Wall Street. Hundreds of protesters gathered Saturday in New York to mark the three-month anniversary of the movement. Demonstrators spent the day trying to occupy a new space following their eviction last month from Zuccotti Park. Two attempts at occupying the space were stopped by police, and more than 50 people were arrested. Among the people gathered Saturday was New York City Council Member Ydanis Rodríguez. He said the movement would continue. COUNCIL MEMBER YDANIS RODRÍGUEZ: This movement has been built on the need of the working class and the middle class. This movement is not going anywhere, is not leaving this city, unless we take particular initiatives to close the gap between the 1 percent and the 99 percent. AMY GOODMAN: Democracy Now! Jon Gerberg and Ryan Devereaux were at the demonstration Saturday and spoke to protesters. Here are some of the voices from the streets. NELINI STAMP: Nelini Stamp. And I’ve been involved in Occupy since September 17th. The last three months have been really amazing, and in my view, I think that we have sparked a national narrative of economic inequality and economic justice. And it’s really great to see that, you know, even though we don’t have the physical space of occupation, we are still around and, you know, are making a difference and a change. OCCUPY PROTESTER: This was essentially a confrontation on the 17th of December, the three-month anniversary, also the one-year anniversary of the self-immolation of Bouazizi in Tunisia. And this was meant to confront the police at allowing protesters to use this space. So I think that’s why this happened on Saturday and why this was planned to happen on the three-month anniversary of the initial occupation. LISA FITHIAN: Lisa Fithian. I’m here with Occupy Wall Street. I think real space is critical to this movement, because it’s a place where we can establish the commons and show that in fact you can have a different set of economic and social relationships than what we’re used to outside our spaces. So, when we had Liberty Park, just like every other occupation, we began the practice of setting up all the social systems needed to support us being fully human. And we don’t have those spaces in many places. And space gives us a place where we can meet and engage in that exchange. JESSE LAGRECA: Jesse LaGreca. I’m a New Yorker. I’m with Occupy Wall Street. Let’s also celebrate the fact that we’ve really moved the conversation forward, because, you know, the reality is people are hurting. And three months ago, we were talking about austerity, about budget cuts, about what can we cut, taxes for the rich, and what can we cut, programs that working-class people need. And now the conversation has totally shifted. We’re talking about income inequality. We’re talking about campaign finance reform, reforming Wall Street, you know, a number of things. So, I think it’s very important to be in public, talking to our neighbors, just having this basic conversation. DWAYNE HENRY: Dwayne Henry, Occupy Wall Street. It’s a global occupation. And wherever you are, your community is what you occupy. You go to your community. There’s Occupy Brooklyn. There’s Occupy Bushwick. There’s Occupy Harlem, Occupy the Bronx. There’s Occupy Fayetteville, North Carolina. Like, it’s your community. You take your community, and you organize your community. And you get the ear of your representatives and your senators. It’s not about occupying Wall Street. It’s about occupying everything. AMY GOODMAN: That piece by Democracy Now!’s Ryan Devereaux and Jon Gerberg, both reporters on the street covering the protest on Saturday, and both were roughed up by the New York police. Ryan Devereaux, Democracy Now! fellow and reporter, here with us now. AMY GOODMAN: You were wearing your credentials around your neck. RYAN DEVEREAUX: I was wearing my credentials. Jon was wearing his credentials, which are NYPD-issued credentials. I couldn’t move anywhere. I told him I couldn’t move anywhere. I told him I was press, but he continued to put all of his weight into his fist, which was pressed against my throat. And then, after he did that, he wouldn’t let me go. Protesters tried to pull me away from him, saying, “He’s peaceful. He’s peaceful.” The officer managed to pull me out of the crowd. I was certain I was going to be hurt or arrested, or both. For whatever reason, I started mentioning the names of detectives that I knew, and he decided to let me go. Meanwhile, Jon, who was over to my left, was holding a monopod above his head, so he had both hands up, so he couldn’t defend himself. And while he was doing this, a police officer apparently punched him three times in the kidneys. Jon was wearing NYPD credentials around his neck. So it goes to show you that it doesn’t matter if you’re wearing, you know, the credentials that Democracy Now! has or you’re wearing the credentials that are supposed to protect you. The NYPD seems to think it’s OK to treat you as a second-class citizen. AMY GOODMAN: When I went up to the police officer who attacked Jon Gerberg to complain, he told me, if I didn’t get back on the sidewalk, he would arrest me. The police officer next to him said, “I have nothing to do with this,” responding to the abusiveness of this police officer that had attacked Jon. Are you seeing an increasing amount of this? And what has Mayor Bloomberg said about going after reporters in these cases? RYAN DEVEREAUX: Well, it’s hard to say if we’re seeing more or we’re just seeing more of the same. It’s important to keep in mind that approximately one month ago, as we mentioned in the lede, occupiers tried to take this space owned by Trinity Church, and a number of journalists were arrested in the event trying to cover that. And this was right after a number of journalists were roughed up and arrested trying to cover the eviction of Zuccotti Park. Major news publications sent a letter to the NYPD, asking that they start treating reporters with respect, with the respect that they deserve when they’re covering their job. AMY GOODMAN: Including the New York Times. RYAN DEVEREAUX: Including the New York Times, including the Associated Press. Ray Kelly, commissioner of the NYPD, then issued an internal memo to his police officers, reminding them that they need to respect reporters who are attempting to do their job. Since that time, more journalists have been hit, journalists have been arrested, and in the case of what happened to Jon and I on Saturday, we’ve been roughed up. And we’re just there trying to do our jobs. We identify ourselves as journalists. AMY GOODMAN: And, of course, we’ll continue to cover these protests. Thank you, Ryan Devereaux.